The Catholic Perspective on Paul Podcast just turned 20,000 downloads! That means the mp3s for the PaulCast has been downloaded over 20,000 times. Thank you and please feel free to pass along suggestions and criticisms. I’ll try not to flinch too badly. Click on the triangular “play” button above. Love the website and everything you’re writing. I’m a Fort Worth former Reformed/Presbyterian now going Catholic (currently in RCIA.) You’re stuff is a true inspiration; I also love the Called to Communion site. P.S. Do you still ever make it over to Fort Worth. I’m looking to talk to more people who made the same jump I’m making. I’d love to connect some time. I get over to Fort Worth about once a month. Why did the podcasts stop? The last one mentioned that you were going to do divorce, remarriage, annulment and canon law. What happened? Please continue!!!! Will you be continuing the podcasts? They have been instrumental in my “tiber crossing”. Thank you! Yes, I’ll resume the podcasts in June. 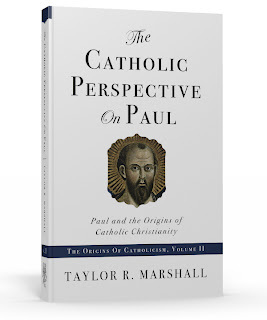 I’m just bogged down with the Catholic Perspective on Paul book right now. I’m very sorry, but on “Crucified Rabbi” the link to iTunes doesn’t seem to be the right one. I think your current title is much more relavant. The New Perspective on St. Paul is the current controversial paradigm that is making Protestants take a hard look at their own traditions. The Catholic Perspective is just an extension and completion of the New Perspective.